Went in for my last day at work, mostly just to hand back my laptop and phone and stuff and it was very strange. I had nothing to do, being my last day, so I just read the news and whathaveyou, chatted to a few people, went out for coffee, surfed so more. And that took me to 10am. I called my boss – that was fine, he’s a nice guy and I really like working with him. I called a few other folks, most of them were out. I got more of a farewell from the receptionist (who is lovely and like a lot of girls in that kind of role, really undervalued) than from my actual colleagues. So in the end, it was just a couple of the guys for a pint at lunch and that was it. Anyway, Monday, new job, I already feel welcome. Can’t wait. 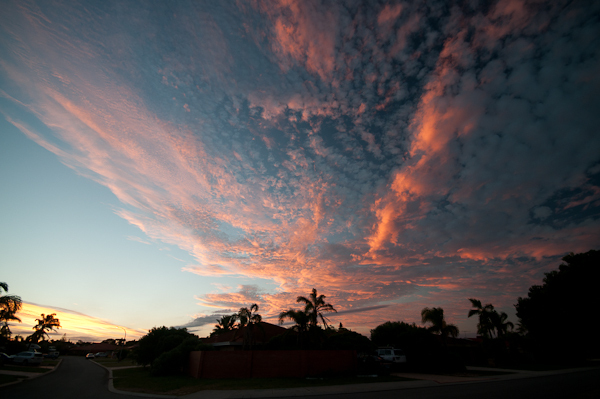 Tonight – awesome sunset. But I didn’t have faith that it was going to real shine and stayed at home. Bugger. It would have been awesome down at Point Peron, on the beach with the rockpools. Ah well – live and learn. And now, I’m about to go get a bottle of wine to celebrate the end of one job and the start of the next. Onwards and upwards, to insanity and beyooooonnnnnd. A bit of an anti-climax, really. It was a terrible anti-climax, but actually, on reflection, entirely consistent with my experience of starting work there, when I was left on my own for weeks with no orientation, hardly anything to do and nobody in the office to speak to. CONGRATS on the new job and yeah that is a little weird. Not unlike the last day of my job before I moved cross country though. No fanfare or anything. I hope Monday goes great! Have a relaxing weekend! Thanks Lauren – this move has been a while in motion and it’s something of a significant moment in my career. I learned a while ago that companies treat their employees as numbers and not much more and there’s no point in having an emotional attachment in your place of work as it will only ever been one sided and leave you disappointed. That said, I kind of expected something, an email, a phonecall or something, but in the end, I had to make the calls myself. Sounds like it happens everywhere. Ah well. On day I’ll start my own company and actually value my employees as real people who spend 40+ hours a week of their lives there and who deserve better. This weekend is cool – am writing, listening to music and am very relaxed! Indeed! And here’s to buying a load of posh new work shirts in England next week too. I need to feel smart and different on the outside too. Congrats on your new job Charlie :). I wish you all the success but I know you don’t need it ;). And this sunrise photo really is breathtaking. Loved this post. Thank you 🙂 You know when you take something on that you know is one step up from anything you’ve done before? Well this is about 5 steps. In a good way though, I’m not taking on the equivalent of being an astronaut or anything, but this is definitely pushing the envelope. My new employer was very quick to snap me up though, and I’m using their confidence as my own for now! Ha! sunsets here are often gorgeous, sunrises too, although I have to wait for winter to see them properly. It’s hot and a bit cloudy today, hopefully we’ll get some good skies tonight – I’ll go out for a proper photo session tonight if it’s looking even vaguely ok.
As I said, end of my 3yrs at last job was weird too…Oh well, onwards and upwards! Must come down and join you for a sunset shoot. You’re right, Point Peron is awesome. I think this odd leaving thing must be how it goes with bigger companies. Very strange. Point Peron is cool and there are plenty of spots nearby too to get some good long exposure sunset type pictures – let me know!